Whether you need to start from scratch or want to mix it up, we’re ready to help. 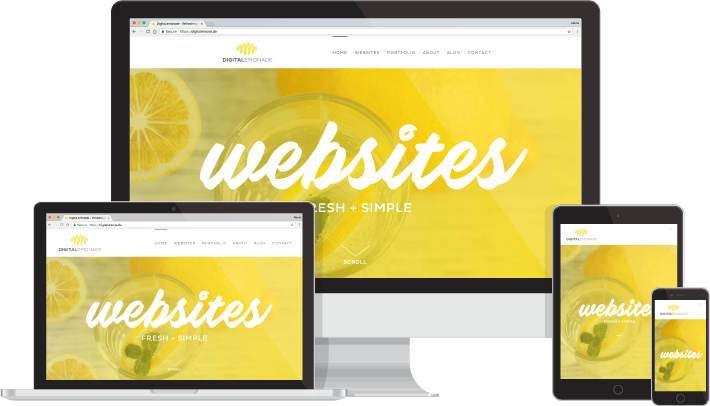 Our team creates clean, user-friendly websites that will make your audience want more. Save money and update your site quickly – all by yourself. We get the priorities of small business owners, so we leave all of our clients with customized documentation so they can get the work DONE. We also provide one-on-one training post-launch so you don’t feel left hanging. Stay in front of your audience everywhere, all the time, with a website that translates to all devices. You can’t afford not to. These reliable platforms are your base to build on. They’ll grow with you, too, so you don’t have to worry about starting all over again year after year. This is for you if. . .
you’re ready to invest in your website early. We love knowing that other small business owners exist and want to talk. Learning about your passion-turned-trade, the business your family has run for generations or the side project you’re entertaining gets our juices flowing. We’ve created a little form where you cansay hello! Once we hear you’re thinking about a website, we’ll want to set up a time to talk. If you’re busy, 30 minutes on the phone is great. If you have time to grab a latte, we keep many of the neighborhood coffee shops afloat and would love to show you a favorite while we hear all about you & your website goals and dreams. If your project sounds like a great fit (i.e. you want a website and not a spaceship), we’ll hit the ground running. A few questions will help us know exactly what you need from us, which lets us generate an estimate, scope and timeline for your project. Once everyone agrees on where we’re headed, you’ll receive a list of everything we need to collect from you in order to begin building (photos, text, deposit, etc.) and the project will begin its journey as soon as we have those items in hand. It’s time to build! Each site is a bit different in this phase – sometimes we’ll want to chat with you one more time, sometimes we’ll have choices for you to make, and sometimes we’ll just code & design like crazy. Once the site exists and we’ve transformed your content into a beautiful and intuitive website, it’s time to find (and squish!) all the bugs. You’ll review, we’ll review, and then we’ll fix everything we need to before releasing the site into the wild. Even though we don’t build spaceships, we still love launch day. It’s when we get to share our collaborative hard work with the world – and that world gets to benefit from knowing your business exists. On this day, you get to stop apologizing for your website and start using it like the killer salesman that it is. Following launch, we’ll do one final round of cleanup – just in case some of your loyal customers found anything we missed. Once that’s done, we’ll be sure you’re trained on anything you’d like to know how to do and square up for the remainder of the estimate amount. Want us to stick around to ensure the site stays fresh? Great! We’ll work together on a plan to keep pouring the lemonade – continual refreshment that fits in your budget.Take a look at our packages and offerings. Can’t find what you’re looking for? Still have questions? We’d love to help! Contact us now.